Night Under The Stars was established in 2001 to raise funds for The Passage. The Passage’s mission is to provide resources, which encourage, inspire and challenge homeless people to transform their lives. The Passage runs London’s largest Resource Centre for homeless people. A homeless person can be anyone, even you or me given similar circumstances: redundancy, home repossession, a broken marriage, prolonged unemployment, mental illness, personality problems, institutional care from childhood, alienation from family and friends, or violence and abuse. In addition, people who are excluded from benefits, have left institutions, or who are new to London – including economic migrants – are often unable to find accommodation. Ex-servicemen and women also sometimes find themselves homeless at the end of their terms of service. The Daughters of Charity and Westminster Cathedral first opened the doors of The Passage to people sleeping out nearby in October 1980. The work has grown steadily and the Passage Resource Centre now helps 3,000 people each year. In 1990, at the request of the late Cardinal Hume, The Passage opened a temporary night shelter for the cold winter months. This project never closed and developed into our permanent hostel, Passage House, which provides a refuge for 40 people until they can move forward to longer-term accommodation. We have been helping the homeless for 37 years. Contact with local homeless people on the street; encouraging and supporting them to return to their home area away from Central London helping them to seek assistance in our projects; working in partnership with other agencies. Food – hot breakfast and lunch; coffee, tea and soft drinks; showers; hairdressing; laundry; clothing; a place to be away from the street. Help to return to accommodation and support away from central London. Advice on emergency night shelters, hostels, benefits, identification documents, form filling, debt counselling; and on immigration issues. Establishing housing rights and needs; referrals to local authorities where appropriate; permanent and temporary accommodation; special-needs housing; working with private landlords; help in setting up home; links with specialist services; ongoing support; one-to-one befriending/mentoring by volunteers; obtaining proof of identity and claiming welfare rights; assisting people leaving hospital who are at risk of homelessness to find somewhere to live before being discharged. GP surgery; nursing care; specialist mental health workers; specialist drug and alcohol abuse workers; podiatrist; dental examination; homeopathy; and acupuncture. Clients are encouraged and supported to write their CVs, search for work and take up employment or further training if necessary. Extra support is provided when they resume employment. With our support, each month more than ten people end their homelessness by returning to employment. We work in partnership with Land Securities that has established a “sector-based academy”, which guarantees selected clients training, a work placement and a guaranteed interview for a job in the construction industry. Similarly, in partnership with the Goring Hotel, clients are trained to go into hotel and catering. Training and employment also provides basic literacy and numeracy; open access computer training; and vocational guidance. It promotes suitable work opportunities in partnership with Business in the Community; mentoring; and setting up a bank account. A sympathetic ear; pastoral support; a women’s group; special attention for older homeless people; a reminiscence group; and recreational activities and visits. As an individual moves away from homelessness, if appropriate they are given the opportunity to help others as a volunteer, combined with a work-skills training course. 40-bed hostel; open 24 hours a day; access to all Passage services; night-time emergency access; one-to-one support by trained staff; a range of further training, education and leisure activities; and resettlement. 16 self-contained studio flats with 24-hour on-site support for residents who have slept rough for many years. It provides flexible care to encourage the residents to stay off the street. The journey does not finish when homeless people move into their own accommodation. One in eight rough sleepers is someone who is returning to the street. With support from our Home for Good scheme 98% maintain their tenancies. 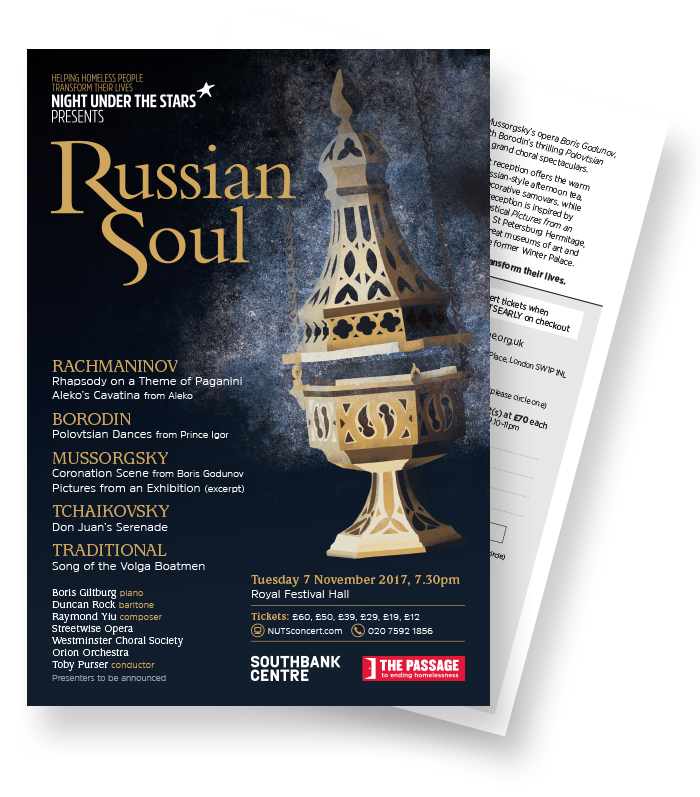 Join us on Tuesday 7 November for Night Under The Stars presents an evening of music celebrating the many-layered ‘Russian Soul’, described by writers such as Tolstoy and Dostoevsky as a spirit of depth, strength, warmth and passion - qualities that permeate the music of the great Russian composers. Boris Giltburg (piano), Duncan Rock (baritone), Robert Lloyd (bass), Raymond Yiu (composer), Streetwise Opera, Westminster Choral Society, Orion Orchestra & Toby Purser (conductor). Presenters to be announced.